A city of fine architecture, churches and art galleries, Paris also boasts a series of attractive parks, spacious squares and landscaped gardens. If you are simply in the mood for a romantic stroll, then a walk along the pathway next to the River Seine may well appeal. 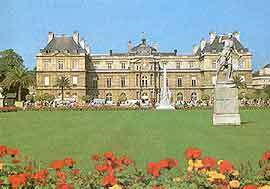 Notable gardens in Paris include the Jardin du Luxembourg, the Jardin des Plantes and also the Jardin des Tuileries. For something larger and more park-like, head to the Bois de Boulogne on the western edge of the city - a simply enormous green space residing within the 16th arrondissement, where it is often referred to as the city's 'main lung'. These gardens are 62 acres / 25 hectares of classical French design. Well groomed and featuring magnificent statues, the Jardin du Luxembourg is ideal for boules and tennis and a favourite for children, who can enjoy attractions such as pony rides, puppet shows and merry-go-round rides. The Bois de Boulogne is one of the most spectacular parks in Europe and contains forested areas, meandering paths and delightful cafés. Covering a vast area of over 2,080 acres / 845 hectares, with more than 22 miles / 35 km of pathways and over 150,000 trees, you can drive through it, or even take a horse-drawn carriage, but many of its hidden pathways can only be discovered by walking. Home to many attractive gardens, along with the city's huge Museum of Natural History and Botanical School, this park also contains a small zoo. Landscaped in the 1980s, this futuristic park was built on the site of the former Citroën automobile factory and has been divided into a series of separate specialist gardens. With large lawns, flower beds, Japanese rock gardens and elegant greenhouses full of exotic plants, the Parc Andre-Citroën is the perfect place to take a break from the city. There is even a 'dancing fountain' which is fully automated and operated by computers. Planted first in 1783 by the order of the Duc d'Orléans, these are the most picturesque gardens on the Right Bank. Previously a private garden, the Parc Monceau still retains some of its historic features, such as a large pyramid and mock ruins. Originally a tollhouse, the rotunda has large wrought-iron gates and was previously known as the Chartres Pavilion. This park is probably most famous for being the place where the world's first parachutist, André Garnerin, landed in 1797. With a small lake, waterfalls, fountains, a grotto and a large meteorological observatory, which is cleverly built to look like a Tunisian palace, Parc Montsouris is an English-style park, full of trees, flowers and plants. 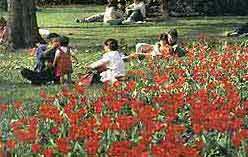 Situated in the south of Montparnasse, in the 14 arrondissement, the park is directly opposite the University 'City' and is a popular venue with the many local students. The Tuileries Garden is situated between the Concorde Square and the Louvre Museum. This Italian-style garden features fountains, a cave, a greenhouse and a menagerie.